Non-diastatic malt is a product of sprouted grains which is used to add color and aroma to baked goods. Non-diastatic malt is used primarily in yeast-leavened bakery products. It functions as food for the yeast, adding flavor, sweetness and crust color to loaves. Non-diastatic malt has no starch-degrading capacity. Malt is produced from sprouted grains, typically barley. However, wheat and rice grains may be used as well. Commercially available wheat or rice malt is rather rare. The higher costs associated with wheat production, and different crop conditions of rice, make them expensive sources for malt production—especially when there’s a fully developed malt industry based on barley grains. 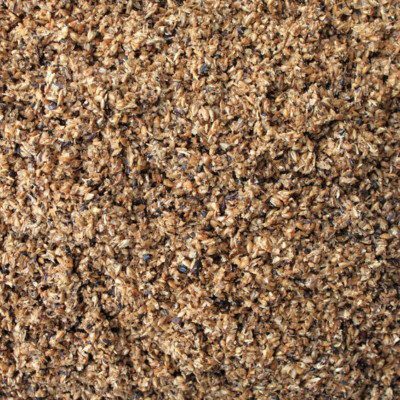 The difference between non-diastatic malt and diastatic malt is the enzyme content or activity. Diastatic malt is not kilned, but dried at low temperatures to preserve its enzymatic activity. Non-diastatic malt is produced for its sweetening and coloring effect. The enzymes have been killed/inactivated through the application of additional heat during kilning (temperatures higher than 160°C). Non-diastatic malt is high in maltose, a reducing sugar, which aids in the Maillard reaction. When added to formulas it mainly functions as a flavoring and crust coloring aid. Syrups and extracts are prepared by the extraction of malt and are specially suitable for the brewing industry. The extract is then concentrated to a syrup or spray-dried to powder form which is normally used for bakery products formulation. In bagels production, non-diastatic malt is usually added to the boiling water to provide a good color and aroma to the bagel. Arendt, E.K., and Zannin, E. “Barley.” Cereal Grains for the Food and Beverage Industries, Woodhead Publishing Limited, 2013, p. 155. Schwarz, P., and Li, Y. “Malting and Brewing Uses of Barley.” Barley Production, Improvement, and Uses, Blackwell Publishing Ltd., 2011, pp. 501–502. O’Donnell, K. “Bakery Formulations and Ingredients.” Bakery Production Handbook, Xlibris Publishing LLC, 2016, pp. 55–57. Cauvain, S.P. “Raw Materials.” Baking Problems Solved, 2nd edition, Woodhead Publishing: Elsevier Ltd., 2017, p. 40. Manley, D. “Cream Crackers.” Manley’s Technology of Biscuits, Crackers and Cookies, 4th edition, Woodhead Publishing Limited, 2011, pp. 283–284. Gisslen, W. Professional Baking, 7th edition, John Wiley & Sons, Inc., 2017, p. 123–180.